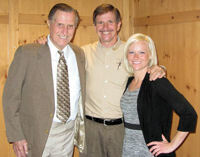 When Randy Hamlett’s now 91-year-old father, Bruce, relocated his family to Michigan in 1970 to launch a water and wastewater equipment business, Randy had little reason to think that he, much less his yet-to-be born daughter, might one day follow in his father’s footsteps. This WEF Legacy Family Highlights article is part of #MyWaterLegacy. It is an honor to serve the members of the Water Environment Federation (WEF; Alexandria, Va.) as your 2016-2017 president of the WEF Board of Trustees. As members, you are delivering essential services with professionalism and imagination.You are simply inspiring, and each of you embodies WEF. I envision the upcoming year as one where we influence change and celebrate our achievements. The Dublin (Calif.) San Ramon Services District’s public education messaging has gone mobile. 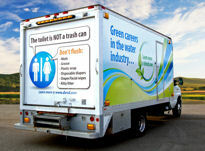 To spread its messages about items not to be flushed down toilets and the value of water, the district has equipped their vehicles with educational signs. Eleven years after the destruction of Hurricane Katrina, the city of New Orleans now is poised to become a model of urban water management for the world. During a seminar held Sept. 8 at the U.S. Environmental Protection Agency (EPA) headquarters, award-winning architect J.
David Waggonner III outlined the “Greater New Orleans Urban Water Plan,” a holistic approach to integrated stormwater management with the potential to save city taxpayers almost $8 billion in flood damage cleanup costs during the next 50 years. The popularity of Pokémon Go, an augmented reality game that superimposes digital versions of characters onto mobile-device views of neighborhoods, parks, and businesses, proves the existence of market for augmented reality games. And researchers at Oak Ridge National Laboratory (Tenn.) want people to understand the science behind these games.